Hot off the heels of the announcement of the their new G2 flagship smartphone and just in time to battle a new iPad mini, LG has quietly announced the LG G Pad 8.3. The slate does bear some resemblance to it's smartphone counterpart but looks like it could be packing a slightly better build quality. Expected specs include a 1.7GHz Quad-Core Qualcomm Snapdragon 600 Processor, an 8.3-inch 1920 x 1200 pixels 1080p capable 273 ppi display, 2GB of DDR2 RAM, 16GB of internal storage, a 5.0MP rear facing camera with 1.3MP front cagin camera, a 4,600mAh battery and will launch with Android 4.2.2 Jelly Bean. The slate will clock in at an astounding a 8.3 mm thin and will come in black and white. The handset should be fully shown off at IFA this week and is expected to hit North American shelves (with no word on Canada yet) so we'll have more information as it comes in. Check out the official press release after the break. SEOUL, Sep. 1, 2013 — LG Electronics (LG) today announced the LG G Pad 8.3 tablet, the latest addition to its G Series lineup of premium mobile devices. The all-new LG G Pad 8.3 boasts the first Full HD display on an 8-inch class tablet, a unique user-experience and wide range of connectivity features. 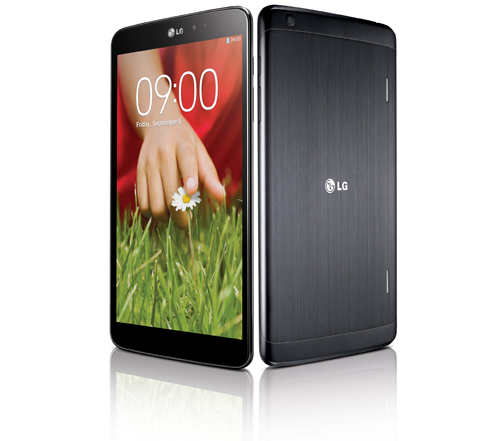 Set to officially debut next week at the IFA 2013 trade show in Berlin, the LG G Pad 8.3 builds on the recent launch of the LG G2 superphone, reinforcing LG’s commitment to leadership in advanced mobile devices through its premium G Series products.